F/B tickets Piraeus - Santorini - Piraeus - Round trip Economy Cat. 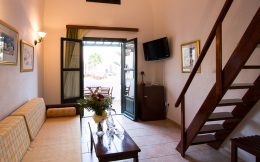 Hotel Village Mathios is a family run hotel near the Caldera cliffs. It is purposely set amongst the green vineyards of Akrotiri, away from the hustle and bustle of the more tourist-orientated towns. We believe this is an ideal, romantic place for couples, as well as for people with special interests in Archaeology, Geology, beach combing and overall comfort and relaxation in mind. 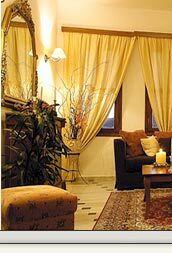 The hotel complex combines a family atmosphere offers all the comforts of deluxe lodgings. This includes a Multi-lingual Reception with Information Service, safety deposit boxes & laundry service. There is an Organized business Center with fax service & internet access as well & free parking. We have 1 large open air Swimming Pool , a full service Pool Bar with sun beds serving light meals, drinks, coffees, cocktails, as well as a BBQ area. There is a fitness room with possibility of massages of Thai & Shiatsu, a TV Lounge & verandas with sea views. We have 1 large open air Swimming Pools, a full service Pool Bar with sun beds serving light meals, drinks, coffees, cocktails, as well as a BBQ area. There is a fitness room with possibility of massages of Thai & Shiatsu, a TV Lounge & verandas with sea views. 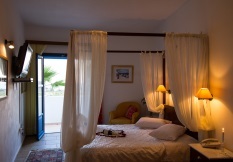 All accommodation offers A/C, SAT TV, mini bar, hairdryer private bathrooms, balconies & direct dial phones. HAND CRAFTED WOOD FURNISHINGS & LUXURIOUS FABRICS, WITH OR WITHOUT LOFTED BEDROOMS, SPACIOUS SITTING ROOM WITH ADDITIONAL BEDS, BUILT-IN CUPBOARDS, LARGE EN-SUITE BATHROOMS, BALCONIES WITH SEA VIEW & DIRECT DIAL TELEPHONES WITH INTERNET ACCESS FOR PERSONAL LAPTOPS. H/B * Full Homemade Buffet Breakfast & Dinner (served in restaurant). - SPECIAL OFFERS available for Grand Suites & families with dinner. - SPECIAL OFFERS for honeymooners and unique packages. - FAMILY PACKAGES : contact us to send you our offers. Rate for 2 Bedroom Suite is for 4 persons / Family Grand Suite sleeps 2 adults & 2 children.